“I come to the garden alone, while the dew is still on the roses, and the voice I hear falling on my ear The Son of God discloses,” are the words of a famous hymn that goes perfectly with the NIV God’s Word for Gardeners Bible Grow Your Faith While Growing Your Garden contributed by Shelley Cramm. 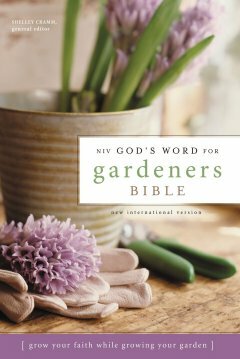 Take a walk in a garden with God as you meander through the Gardeners Bible, with daily devotions centering on the growth of the spirit. With daily essays on things pertaining to gardens, literally and metaphorically, this bible takes you on a journey of the soul of the gardener. Tending, growing and cultivating the spirit. Each essay, under the themes of Garden Tour, Garden Work and Garden Stories, gives you a verse, or selection of verses, a companion of cross-references and plenty of ‘food for thought’. Taking a year to meander through the Bible, just like a garden, our spiritual life is a constant through the year. I was quite impressed with the Gardeners Bible. I’m a firm believer that we are stewards of the land and we are called upon to tend the land even though it may not be the Garden of Eden any longer. Just as we till with our hands, we cultivate our spirit in God’s word. The essays are just right for contemplation, with a very green feel (as in the essay has a lovely green page to separate it out from the rest of the white pages.) The end of each essay tells you where to read the next day and so forth, and there is an index at the back of the Bible for ease of use. The dust jacket and cover of the book are the same image, which I really like. The Bible has a very crisp and fresh feel, just like being in a garden. Shelley Cramm uses an exhaustive bibliography, which is cited in her essays; a feature I always love for further reading. If you are a gardener in Christ and want and a supplemental devotional Bible, I highly recommend the Gardeners Bible. This book was provided free of charge from Thomas Nelson and Harper Collins Christian Publishing for my honest review. Kate, thank you very much for your honest and positive review. I am delighted that you have perceived the book’s freshness and sense of meander, all the while progressing and moving us forward in His Word. Blessings to you as you take care of the land!